STREET CRY (IRE) (Bay or Brown 1998-Stud 2003). 5 wins-1 at 2, Dubai World Cup, Gr.1. Champion Aust. Sire 2015-16. Sire of 1495 rnrs, 1045 wnrs, 117 SW, inc. Winx (MVRC WS Cox P., Gr.1), Zenyatta, Street Sense, Shocking, Whobegotyou, Tomcito, Long John, Street Boss, Oh Susanna, Pride of Dubai, Seventh Street, Heavens Above, Stay With Me, Lyric of Light, Victor's Cry, Majestic Roi, New Year's Day, Here Comes Ben, Street Hero, Cry and Catch Me, etc. SOLEMN (g. by Bernardini). 4 wins from 1500m to 2200m, A$222,715, Geelong Classic, L, ATC Buy Your Next Racehorse at Inglis H., Horsepower Sweetfeed H., 2d ATC Turner Freeman Lawyers H.
Honeywine (g. by Street Cry). Winner. See below. Spiced (f. by Exceed and Excel). 2 wins at 1350m, 2d ATC TAB More Than Winning H., 3d ATC Adelaide New at Coolmore H.
Medovina (f. by Exceed and Excel). Winner at 1200m in 2017-18 in Aust. MIGHTY BOSS (Not a Single Doubt). 2 wins-1 at 2-at 1200m, 1600m, A$1,259,750, to 2017-18, MRC Caulfield Guineas, Gr.1, 2d MRC M&D Dillon Contructions H., 4th MVRC Bill Stutt S., Gr.2. Shiralee (Stratum). 2 wins-1 at 2-at 1000m, 1600m, TRC Tasracingclub.com.au P., 2d Tasmanian Derby, L, TRC Hobart Guineas, L, TTC Weeding Hire P., 3d TTC Cube Seaport H., Young Members Enclosure H.
Bodacious Harmony. 2 wins at 1200m, A$82,750, MVRC Collex Onyx H., MRC Courtza H., 2d MRC Jack Elliott H., MVRC Mitchell Billiards H., 3d MVRC Permark Cabinets H., 4th VRC Schweppervescence Trophy, Gr.3. Producer. CATCH A FIRE (Sebring). 3 wins at 1200m, 1400m, A$248,560, to 2016-17, MRC Angus Armanasco S., Gr.2, MVRC Dr Sheahan H., Shell Ocean Grove P., 3d MRC Ladbrokes Mega Margin H., VRC Emirates Melbourne Cup Tour Trophy, GCTC Marriott Surfers Paradise Magic Millions P., 4th SAJC HC Nitschke S., L.
SEABURGE (Sebring). 2 wins at 2, A$783,375, VRC Sires' Produce S., Gr.2, 2d MRC Caulfield Guineas, Gr.1, VRC Emirates S., Gr.1, MRC Cove Hotel 2YO H., 3d VRC March S., L, 4th MRC Caulfield Guineas Prelude, Gr.3, HDF McNeil S., Gr.3. Baio (Myboycharlie). 2 wins at 900m, 1000m, 3d ATC Inglis Nursery, RL. Glitterbell. 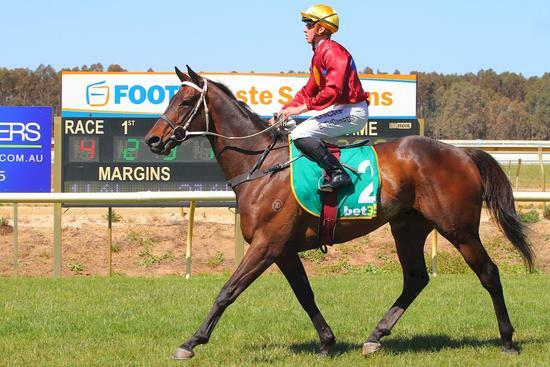 3 wins-1 at 2-at 1200m, 1400m, A$249,875, WATC Bell-Vista Fruit & Veg 2YO P., Perth Racing Newsletter P., State Emergency Services H., 2d WATC Westspeed 2YO P., Our Town H., 3d WATC Westspeed Initial 2YO P., Perth Racing TV P., Westspeed 2YO P.-twice, Del Basso Nursery P., Caroma 2YO P., Good Friday Raceday H., 4th Bunbury TC Western Australian Breeders' Classic, L, Pinjarra RC Magic Millions WA 3YO Trophy, RL. Follows Me. 7 wins-1 at 2-to 1400m, A$100,860, AJC Maytag 2YO H., 3d AJC Ladies Auxilary 2YO H.
Jimmy the Bear. 4 wins at 1450m, 1600m, A$140,990, Qld Tatt's RC Kramer Technologies H., 2d AJC Castrol Oils Ain't Oils P.H., BTC RBWH H., Pitcher Partners H., MVRC Carlton Draught H., STC Blue Haven Pools H., Quasar Contructions (NSW) Pty Ltd H., South Sydney Juniors H., Glenn Keane H., 3d MVRC Wedgwood Vase H., BTC Mater Little Miracles H., Grant Thornton H., MRC Beer Street H., MVRC 5th February Night Racing H.
Rock Honey. 3 wins to 1200m, SAJC Macro Meats H., 2d MRC Molly's Robe H., Peter Moody H.
Mascot Fortune. 3 wins-1 at 2-at 1200m, 1400m, HK$2,662,275, HKJC Lam Tsuen River H., Kowloon Tong H., To Kwa Wan P., 2d HKJC Tung Wah Centenary, Pollock H., Resfa H., Happy Money H., 3d HKJC Club Street H., Good Tension H., Caine H., Jilin H., Youth Services P.
Mead. 2 wins. See above. RODIN (Masterpiece). 12 wins from 1200m to 1900m, NZ$248,425, WRC Captain Cook S., Gr.1, Rotorua Challenge P., Gr.3, Matamata Cup, L, ARC Montana H., Feilding JC Redcraze Bowl, Hawkes Bay Ubix H., Manawatu RC JVL Prestige Realty H., Matamata RC St Petersburg H., 2d Marton JC Metric Mile, Gr.3, WRC Thompson H., Gr.3, Waikato RC Instrument Supplies H., Hawkes Bay Furnware NZ H., Lynn Electrical H., 3d Matamata Cup, L, 4th Marton JC Metric Mile, Gr.3. BALFINE (Zabaleta). 7 wins from 1000m to 1650m, A$116,730, WATC Emu Export Classic H., L, UBS Mortgages Sprint H., Bunbury RC AHA Cup, WATC Bungler H., 2d WATC Gourmet H. Producer. Corporate Memory (Corporate Raider). 8 wins-1 at 2-to 1400m, A$160,845, WATC Serheed Welter H., 3d Bunbury S., L, WATC Goodwood Sprint H., L, Beaufine S., L.
Race Record: 11 Starts 1-1-0 A$77,795. Winner at 1500m, A$77,795, in 2016-17, 2d ATC Gloaming S., Gr.3.